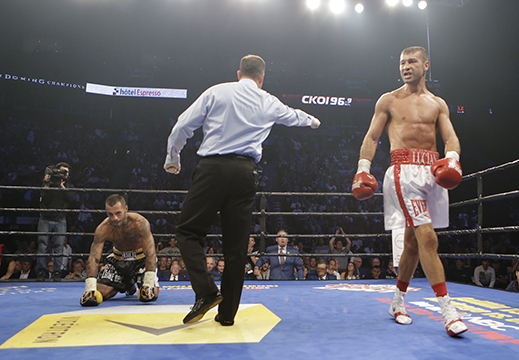 For sheer emotion, it will be a moment hard to top in Montreal sports for 2015: Lucian Bute at ring center, holding aloft his fist, still wrapped in white tape, and then bringing it to his heart and tapping in silent tribute to all assembled, visibly struggling to hold back tears, while all around him the crowd stands and cheers. 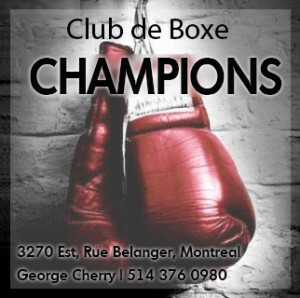 This was the climax of a glorious night of boxing for Montreal fight fans as it saw all of the home fighters triumph, all in impressive fashion, two of the victories on international television via Premier Boxing Champions and NBCSN. 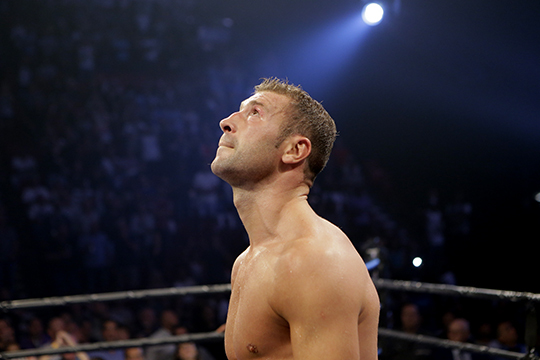 Bute hears the cheers after his huge win. First up was super bantamweight prospect Vislan Dalkhaev who improved his record to 3-0 at the expense of Spain’s Saul Tejada (6-6-2). Dalkhaev, who hails from Russia but now fights out of Montreal for Groupe Yvon Michel, displayed some impressive timing and accuracy as he dominated his more experienced opponent, hurting Tejada repeatedly before rendering him helpless in round five. 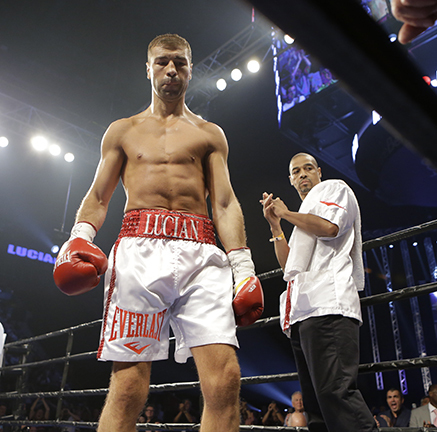 Next was Grant Brothers Boxing’s hot prospect Erik Bazinyan who notched his ninth win and sixth knockout in stunning fashion over Lee Anthony Spitzka (6-2) of Germany. An anxious-to-impress Bazinyan left himself open for a few heavy counters from Spitzka in the opening round, but he settled down in the second and proceeded to dominate, mixing sharp body jabs with hooks and right hands upstairs. In the third the Armenian native caught Spitzka over and over again with clean shots that the German clearly didn’t see coming, before blasting him with a vicious straight right to the head that put Spitzka down for the count. It was another rousing performance by the young Bazinyan. Heavyweight Bogdan Dinu (13-0), of Montreal by way of Romania, had no difficulty at all with Ed Perry and his flabby paunch. This was, to be blunt, a mismatch. Perry, who clearly was not in anything close to fighting shape, barely competed and was hurt every time Dinu landed a clean punch. The American survived a knockdown from a right hand near the end of the opening round, but was down again in the second from a one-two. Perry rose but the referee called a halt. 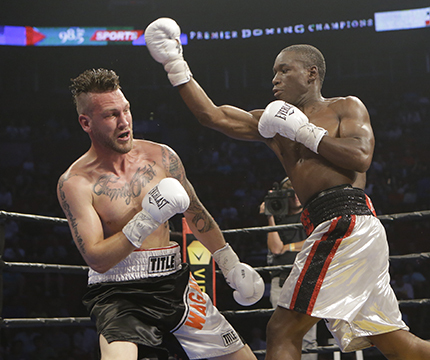 Gifted welterweight Yves Ulysse Jr (9-0) showed again why he is regarded by some as the best prospect in all of Canada as he made quick work of Calgary’s Ryan Wagner with a clean, one punch knockout in the second round. With astonishing quickness and mobility, Ulysse went right to work against the tough and willing Wagner and a series of spirted exchanges followed. Ulysee was too much for Wagner. 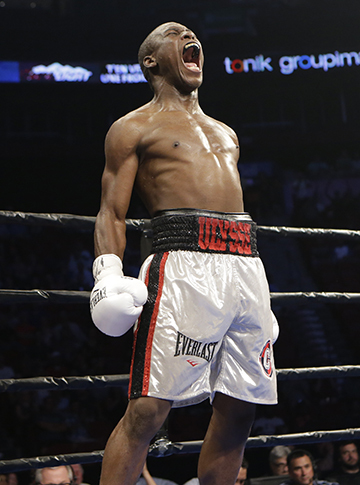 Unfortunately for Wagner, it was Ulysse landing the clean punches. The 25-year-old’s speed, accuracy and power were too much for the Albertan and in the second round a perfectly timed left hand to Wagner’s solar plexus ended the fight. Wagner was in serious pain and it took several minutes for him to recover from that vicious body punch. 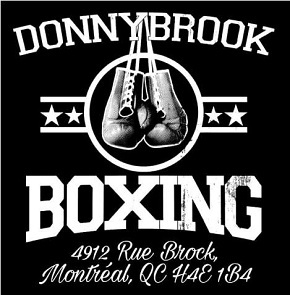 The night’s co-main event followed, a showdown between two formidable light-heavyweights in Montreal’s Eleider “Storm” Alvarez and Isidro Ranoni Prieto of Argentina. This was a tough, grueling and sometimes sloppy battle with some slow stretches but also plenty of action. Both men had the power to rock each other but the deciding factor appeared to be stamina as Prieto’s punch output declined markedly in the middle stages, allowing Alvarez to take rounds on activity. Prieto and Alvarez mix it up. 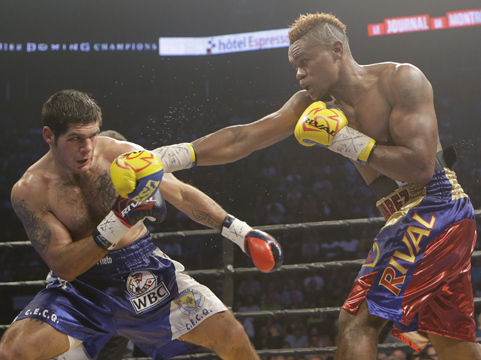 But Alvarez’s chin was tested in round six when Prieto connected with some thumping power shots that clearly shook the Colombian native. The crowd appreciated the action and got some more in round nine with a wild exchange near the end of the stanza. Going into the final rounds it was clear the rugged Prieto was behind on points but it was Alvarez who got the better of an action-packed round 11 as his punches still had snap on them while the tiring Argentinian could threaten only with looping right hands. Give Prieto credit: he won the final round on sheer aggression and deserved better scores than the three 117-111 cards offered by the judges, all for Alarez, who is now in a position to test himself against some of the elite contenders at 175. 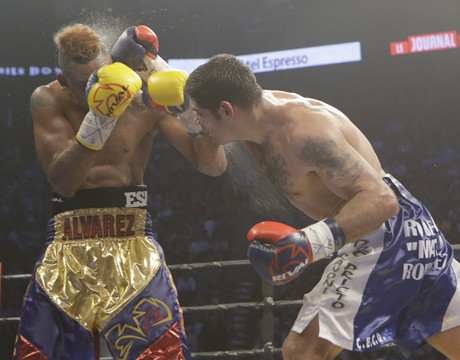 Alvarez vs Prieto was easily the most competitive fight of the night. 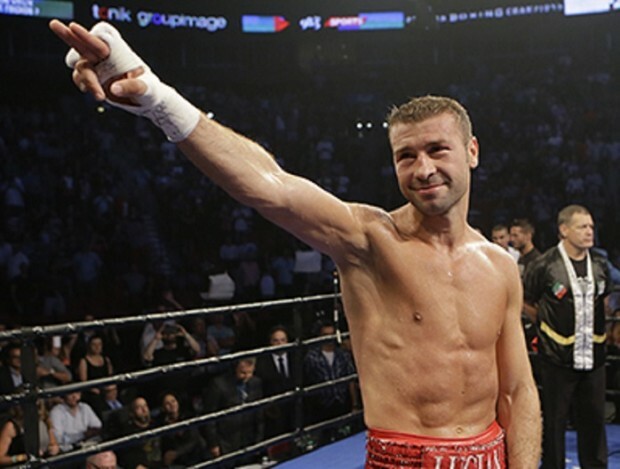 During the Alvarez-Prieto struggle, the Bell Centre’s big screens occasionally flashed between rounds to Lucian Bute getting ready in his dressing room and each time the crowd erupted with cheers. It was now time for the main event and the fans roared again as the former super-middleweight champion and hometown hero, in his familiar white and red, made his way to the ring. Make no mistake, this was a showcase match, designed to give the southpaw Bute a chance to shake off the ring and regain his confidence after after 19 months of inactivity. Everyone knew Andrea Di Luisa posed little threat and the question was not if Bute could win, but if he could dominate and look far better than he had in disappointing performances against Denis Grachev and Jean Pascal. Bute with trainer Howard Grant. A slightly skittish Bute won the opening round, circling the ring and establishing his jab, albeit with little weight on the punch. He threw his first left hand with authority and bad intentions just before the bell. In round two he looked increasingly comfortable, staying in the pocket more and finding openings. By contrast, Di Luisa appeared nervous and stiff. The Italian took a heavy left hand near the end of the round and the crowd voiced its approval. 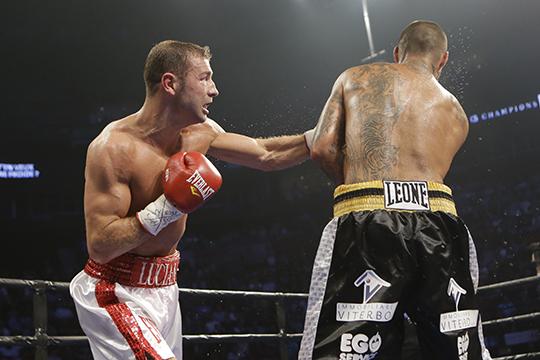 Bute added the left hand to the body to his attack in round three as he increased the pressure. Showing no fear of Di Luisa’s power, the former champion opened up, putting more weight behind the left hand as swelling appeared under Di Luisa’s right eye. Picking his shots, Bute dominated the final seconds of the round with a series of strong lefts. Bute shakes off the ring rust. Bute wasted no time moving in for the finish, standing flat footed and putting all his weight behind his punches as he teed off on his dazed opponent. At least seven hard, clean blows landed on a stunned Di Luisa before a red towel of surrender flew from the Italian’s corner and the referee stopped the contest. It seemed a slightly hasty reaction from Di Luisa’s people, but there was plenty of time left in the round and the chances of Bute not getting the job done were slim to none. Di Luisa was hurt, taking shots and not firing back. Di Luisa down in round four. The moment the fight ended, a scene of jubilation erupted in the Bell Centre. The crowd roared as Howard and Otis Grant jumped through the ropes to embrace the victor before Bute strode about the ring, pumping his fist, pointing at the crowd and shouting, “I’m back!” Minutes later the official result was announced and Bute clearly had difficulty holding back the emotion, which in turn only inspired more emotion from the former champion’s fans. Chants of Boo-tay! Boo-tay! rang through the rafters of the Bell Centre as Lucian saluted the crowd, his expression one of relief and fulfillment. Di Luisa’s corner signals surrender. If Bute looked like a man who had been wandering in the wilderness for years and had finally found his way home, it’s maybe because that is exactly the story which has unfolded since his crushing defeat to Carl Froch in May of 2012. Injuries, setbacks, disappointing performances, and a search for the right people to help guide his career all led him to this moment, with thousands cheering for him in his adopted home city. 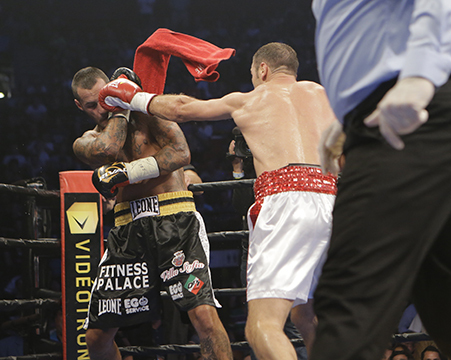 Clearly, for Bute, there is more to landing that big left hand of his than just timing, balance and conditioning. 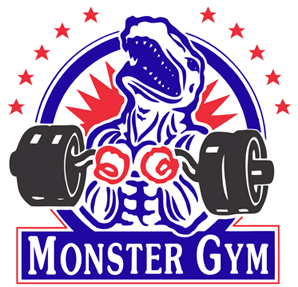 As he shouted repeatedly, “I’m back!” it sounded very much like a statement of some crucial inner confidence regained, as much as the ability to render an opponent helpless with his punching power, something that hasn’t happened in a long time. 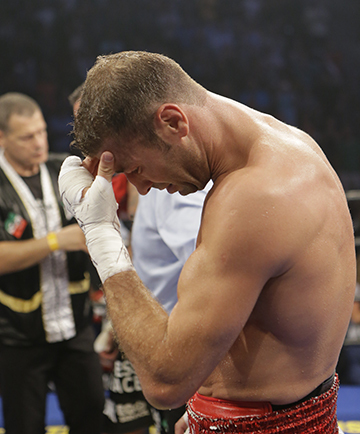 An emotional Bute after the fight. Andrea Di LuisaEleider AlvarezIsidro Ranoni PrietoJunior UlysseLucian ButeYves Ulysse Jr.